Nick is an experienced leader and a former Change Director in Barclays, where he used his knowledge of project/change management and behavioural psychology to lead the people workstreams of global change initiatives. After leaving Barclays he provided change management consultancy to global organisations before focusing on his passion of helping organisations to build high-performing teams. This led him to create the highly-regarded Team DyNAmics© Model, which helps teams to measure how effective and engaged team members are across 16 Elements, identified as being the foundation upon which high-performance teamwork and success are achieved. Through his training company, Ngagementworks, facilitates high-impact team development programmes with many global brands, engaging individuals, motivating teams and helping them transform and achieve even greater success. 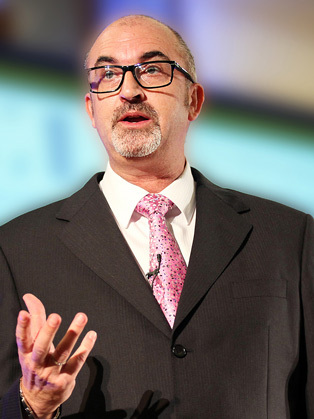 As the foundation of Nick’s presentations are about people and behaviours, he is experienced at speaking across all industry sectors and at all levels within organisations. Nick has been a repeat speaker at our events for the last couple of years. His ‘Sunshine Yellow’ personality shines through as he grabs people’s attention and respect almost immediately. He has many tales to tell and expertise to share in team building and business opportunities to succeed. Nick has an infectious character and the feedback from attendees through our formal surveys has been nothing short of very positive. Results speak louder than words and Nick is not short of success stories where he has been engaged by organisations across the globe. I heartily recommend Nick to assist you/your organisation to improve. “Nick spoke at our annual International Conference on “The Adaptable Leader”. Nick makes an immediate impact with this informal, almost fun (yes, fun!) approach to presenting. That said, Nick has an important point to make and make no mistake his style ensures everyone takes something away whilst enjoying themselves into the bargain. I’m sure we’ll be inviting Nick back to share his insights again in the future. Nick is truly an outstanding professional conference speaker and facilitator. Arguably, Nick had the most difficult session of the symposium, after lunch on the last day of the 2-day event. His passion, energy and expertise on “How To Achieve High-Performance Teamwork” engaged, motivated, inspired and educated the 600+ delegates for the whole 2-hours he was on stage. I would highly recommend Nick as a conference speaker who is able to engage and educate large audiences, something that only an exceptional few are able to deliver successfully to such a high-standard. I hired Nick after seeing him speak at a European PA Conference in front of 400. He is an extremely engaging, lively and entertaining speaker who is sure to liven up any audience! I joked about his slot being the ‘graveyard shift’, after lunch and having to lift a room that is starting to get tired, he 100% delivered on that and Twitter was awash with positive feedback on his session. He also delivered a very important message and I know our delegates took a lot away from his presentation. Even more importantly Nick really worked in partnership with us. He engaged with our delegates long before the event via social media and email and I think that is really important for any speaker. He really got to know our target audience and therefore knew exactly how to pitch the presentation. I would not hesitate in recommending Nick for any event!